I'm a Microsoft SharePoint specialist with an interest in performance, scripts and bug hunting. Office 365 audit exports are quite complicated behind the scenes. If you look at the data in CSV format you’ll quickly see there’s four fields; Time, User, Action and Detail. The fun is in the Detail field, it’s really a JSON object with all of the interesting data that the audit log holds. Whilst it’s possible to use Excel to expand those objects and convert them into usable CSV content it’s a bit clumsy. The script below is a first draft at a script to split the content up into separate logs for future analysis. Notes: This function is not optimised for large files. to result in excessive disk write activity. #Details are encoded as JSON data. There’s plenty of room for improvement. It’s highly likely that the UserType field is the key to exporting to a more concise set of exports that share common fields. If anyone’s interested i’ll give it another go. This entry was posted in Office 365, PowerShell and tagged Office 365, Office 365 Audit Log, PowerShell, SharePoint Online Audit Log on March 3, 2016 by Alex. Login with your tenant admin account. It may be that you can use an account with less excessive rights, however I can’t test that at this moment. This will open a popup that can show you the audit log. 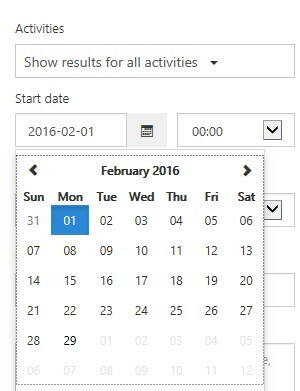 Select an appropriate Start date, normally 1 month in the past. By default it will start with only the last week selected and will not allow you get more than a month of data at one time, probably to reduce the data size to something more manageable. Click Search to get all the audit logs for that period. Scroll to the top right corner, in the ridiculously small window that you can’t even re-size in my older version of IE. It will then download the file, this may take some time, in limited tests I have seen ~100KB/sec transfer and file sizes of approximately 4-6MB per user per month. Zip the file up before sending it anywhere, the content is highly compressible with roughly 95% reduction in size. This entry was posted in Uncategorized and tagged Office 365, Office 365 Audit Log, Save Audit Log, SharePoint Online Audit Log on March 1, 2016 by Alex. This is based on another blog post here: http://blog.scoreman.net/2013/02/create-site-collections-in-sharepoint-online-using-csom/. In that article the author shows how to use the CSOM with C# to create a Site Collection in Office 365. Add-Type -Path "C:\Program Files\SharePoint Online Management Shell\Microsoft.Online.SharePoint.PowerShell\Microsoft.Online.SharePoint.Client.Tenant.dll"
$newsiteUrl = "<URL of Site Collection to Create>"
Write-Host "Establishing Connection to Office 365." Write-Host "Now configuring the new Site Collection"
Write-Host "Site Creation request completed. Note that the creation process is asynchronous and provisioning may take a short while." I’ve tested this on Office 365 but haven’t tried it with On-Premise SharePoint 2013 so far. This entry was posted in Uncategorized and tagged Create, CSOM, O365, Office 365, Online, PowerShell, SharePoint, Site Collection, Tenant on August 20, 2014 by Alex. This is a basic topic but one that crops up time and time again. By default SharePoint will create databases with settings to grow 1 MB at a time. That means that if you add a 5 MB file the database will grow 5 times to fit it in. If you add a 250 MB file (the default largest size file for a 2013 farm) that means a worrying 250 growth operations will be needed. During a growth operation the database is completely unresponsive. That means that any access at all, read only or not, will have to wait for the growth to complete. That will result in slower responses for users and reduce the number of users that your environment can support at any one time. As such growth is bad. It varies depending on your hardware. In my test environment, a Hyer-V machine with a dynamically growing VHDX on an SSD I got the following numbers. I’m going to put up a post on how I got these numbers sometime soon, i’ll update this post once I’ve done so. The duration for growth operations scales with the size, however the change isn’t quite linear, there is an overhead to each growth that makes a single larger growth more efficient. As such it’s best to grow as few times as possible with larger individual growth operations. On the other hand as you can see a single growth operation can take a significant amount of time. Growing by 1 GB took around 2 and a half seconds. That is a significant delay and whilst it will be infrequent your users may well notice, especially in a heavily used site. 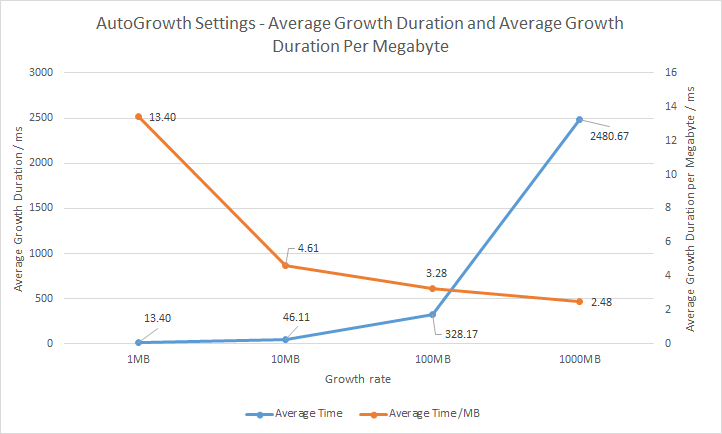 For a 250 MB file the 1 MB growth rate would take 3.25 seconds. A 10 MB growth rate gives 1.15, 100 MB comes in at 0.98 and 1000 MB at 2.48 seconds (but you only have to grow every fourth item). This is more or less the worst possible choice. Every time a database grows it needs to lock the entire system. Whilst that might only be for a short time for each one the total time is excessive. As we saw this will take around 3.25 seconds to perform all the growth needed for a 250 MB file. The only redeeming feature of this setting is that it is very efficient for storage space. 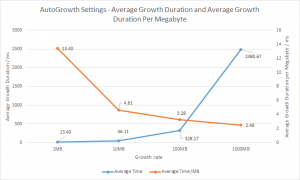 By setting the file growth rate to the web application maximum file size you can ensure that only a single growth operation will happen for any file upload. This gives a relatively low individual growth duration which means the disruption for a single file will be as small as possible. On the other hand it will result in a lot more individual growth operations than a larger size. That means that in a highly used site you may have statistically significant and detectable amounts of downtime. By setting the autogrowth setting to an arbitrarily large size, eg. 1 GB, you can minimise the number of growth operations that need to occur. This has a much lower total disruption than the Default settings or setting to the maximum file size but when it does occur the delay can be significant. This is a popular setting. As an alternative to autogrowth settings you can grow the databases ahead of the rate that users put data into them. To do this your SQL management team would set an alert on the database fill rate to ensure that there is more free space available than can reasonably be expected to be used in a day. If the database drops below that point then your SQL admins will grow the databases manually during the next scheduled downtime or period of low load. This avoids/minimises any of the aforementioned disruption to users when growth occurs but requires an alert and capable SQL team. If your SQL team miss the alert then either a Max File Size or Large Fixed policy should be in place as backup. The most performant option is to grow your databases to their final size on creation. This requires a highly predictable environment with site collection quotas in use to prevent the databases growing beyond their expected size. It’s also a very storage-space inefficient way to manage your databases. Which option you should use depends on where you’re putting SharePoint in. My preference is to set the growth settings to the maximum file size for the web application it is attached to. This provides the ideal blend of minimising total growth time whilst avoiding large delays when larger growth operations are needed. If you have a good SQL team behind you to grow the databases nightly then that is an even better way to avoid disruption to users. However that does require the SQL team to be available and able to assist, if this isn’t available or you’re in a really high usage environment then you should pre-grow the databases up front and never have to suffer growth again. This entry was posted in Uncategorized on July 18, 2014 by Alex. Note: this applies to SharePoint 2010 and 2013, it is not viable for SharePoint online / Office 365. Fun fact, SharePoint, if you’ve got branching logic in your survey, allows you to save your response to a survey! This is great news. However on TechNet someone asked if it were possible to find these incomplete posts to remind the user that they haven’t finished? Normally you’d assume that all you’d need to do is log in with a site collection admin account and you’d magically be able to see all the responses, even those that haven’t been completed. However in this case you’d be wrong. Even with Site Collection admin rights those incomplete responses are hidden from you. Now that data is still in the SharePoint list and rather than mess about with permissions and settings, which could have unforeseen consequences, let’s see if we can’t pull it out of the list with PowerShell? The first thing to do is see if we can get the real number of items from the survey. The easiest way to do that is to check the item count. That gives you the number of items, which you can compare to those visible. In my case I had one completed and one partial, leading to a total count of two. Which the script agreed with. When you look at the object in PowerShell you can see that there’s a few fields that are different between a completed and a partial response. In this case we have two that are of interest. Of the two i’m going to use the ‘HasPublishedVersion’ field. Live the ‘Level’ field it will become true as long as a version has been completed, however unlike Level it will remain true even if the user starts to edit it later and somehow manages to do a partial save. Let’s extend our script to list out the number in each group, then list the users who created them. This entry was posted in PowerShell and tagged missing, PowerShell, save, SharePoint, SharePoint 2010, SharePoint 2013, Survey on July 10, 2014 by Alex. It’s been a while but it’s time for a new post. Someone asked on TechNet () how to get a summary of all the custom choice columns and the options they have. I didn’t have the time to put it together at that moment but I thought It’d be a good exercise. This will work for 2010 or 2013 but will not work for Office 365 or SharePoint online. For that a different approach would be needed. So, let’s assume that we’re only interested in the site columns. To do that we’ll have to grab the SPWeb object and loop through the columns there that are of the appropriate type and list them out. That’ll list out the columns to the screen but it’s not a great solution. It’s printing out too many columns, it’s also just printing them to the screen. We need it to serialise this into a format that we can use. There’s loads of ways to do this but my preference is to create custom objects to contain the information we collect, then assign them to an array which we can process later. So, after changing the write-hosts to write verbose and putting in our custom objects we get this! Which actually makes things worse as we no longer get any results! Let’s add that in some xml work. I’m still not entirely happy with the way PowerShell and XML work together so this example is a bit clunky but it works. So, this now dumps out the data we’ve asked for but it also dumps out all the pre-packaged columns. This is a problem that isn’t easily fixed, there isn’t an ‘OOTB’ flag on fields but there are a few we can use to filter them out. Hidden – Not relevant in this case but often handy. In this case we’ll filter out groups that are part of the ‘_hidden’ group earlier. -not $_.Sealed -and $_.Group -ne "_Hidden"
But that’s still not perfect, so instead of filtering the terms out right now let’s make it a bit more useful first. When you look at columns in SharePoint they are organised in Groups. We can see those properties in PowerShell and group our elements using that field. Of course once you have the group name you can filter those options out by using a blacklist of groups to avoid reporting on. And there you have it. A working report that will summarise all custom choice columns in a SPWeb object and save them in an XML file. This entry was posted in PowerShell, Uncategorized and tagged Choice, Columns, List, PowerShell, SharePoint, SharePoint 2010, SharePoint 2013 on July 7, 2014 by Alex. Sometimes you need to lie to SharePoint. In this post i’ll show you how to change the details for who created an item, modified it and when they modified it. When you’re doing bulk uploads, dealing with lists where you wish to use the Advanced features of only allowing users to edit their own items or just testing some behaviour, eventually you’ll wish you can change the values that SharePoitn doesn’t let you change. As you can see we access the item properties by treating the $item as a hashtable and use the property name as the key. #Store changes without overwriting the existing Modified details. Setting the value is a bit more complicated. To do that you have to build the appropriate user string. In my example the user is already part of the site, if they haven’t previously been added to the user information list you’ll need an extra step here to insert them. The second bit which differs from your usual PowerShell update is the use of the UpdateOverwriteVersion() method. There’s several update methods in SharePoint but only this one will preserve your changes to modified by and created by. This script is to show how to read, modify and otherwise manipulate the created by and modified by details on documents. This is to enable correction of incorrect data as part of migrations. It is also useful to enable testing of retention policies. This entry was posted in PowerShell and tagged Author, CreatedBy, ModifiedBy, override, PowerShell, SharePoint 2010, SharePoint 2013, Update on November 7, 2013 by Alex. Someone asked for a script that could delete previous versions for SharePoint 3.0. I don’t have a 3.0 dev environment but I do have a 2010 build and it interested me. #Note, the version ID goes up by 512 for each major version. Write-Verbose "No major versions to delete"
Write-Verbose "No minor versions to delete"
This entry was posted in PowerShell and tagged 512, Delete, Major, Minor, PowerShell, Programatic, SharePoint 2010, SharePoint 2013, Versions on July 29, 2013 by Alex. A post on technet asked about how to deal with long running search crawls that were impacting users when they overran into business hours. In large SharePoint environments that shouldn’t really happen but it’s a fairly common concern in smaller shops. Pause a specific (or all) crawl(s) during working hours. I wanted to drop the performance of the crawl down so that it can still keep going but not impact the end users. $shRule = Get-SPEnterpriseSearchSiteHitRule –Identity "SharePoint"
It turns out that in the API a crawl rule is known as a hit rule. Hit rules have two important values, the ‘rate’ and the behaviour. The script above was enough to let me create a rule and set it to either run at a normal page or with a 16 minute delay between requests. And it worked! Well, it created a rule and that rule worked. Sadly i’d forgotten that the crawler rules are only checked when you start a crawl. If you start a crawl then punch the delay between items up to 1000 it won’t make a blind bit of difference. It turns out that pausing the crawl doesn’t make the search engine re-check the crawl rate. So, a failure. The only thing i can think of is using reflection to find out what is happening in the background and then doing something deeply unsupported to modify the values in flight. Maybe another time. This entry was posted in Uncategorized and tagged Crawl Rule, Failure, Pause, PowerShell, Scripting, Search, SharePoint 2010 on May 24, 2013 by Alex. A routine but really annoying task came up today. The status of BLOB caching for all Web Applications, normally I’d hop into the config files and check but these are spread over 6 farms. To make things worse each farm had between 4 and 5 web apps and between 1 and 3 WFEs. In total that should have meant checking in the region of 50 config files. #This is horrible code but I haven't found a better way to get the value in a usable format. #Script to check the blob caching configuration in all webconfig files in your farm on all servers. #find a better one at the moment. #foreach server running the Foundation Web Application. #This could be improved using regex. This entry was posted in PowerShell and tagged BLOB, CACHE, config, farm, PowerShell, SharePoint 2010, web.config on May 22, 2013 by Alex.